Our new boat has been all over the Pacific Northwest since it was built in the year 2000. From what I understand, it was originally sold to someone in Hawaii as a charter boat over there. 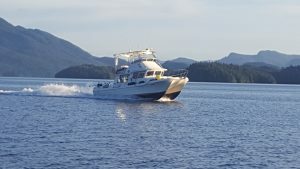 The next owner bought it and had it shipped to Sitka Alaska (just 185 miles North of Ketchikan) where it lived for several years. The next owner was the man i bought it from who shipped it down to Anacortes Washington and brought it to Alaska on several occasions for fishing trips. She is currently powered with 260 HP Volvo Diesels running ZF gears to straight shafts. Although she is not as fast as Miss Parker, she is steady and smooth even in rough water. I was amazed many times during the 2016 season at how well this boat runs when the waves start to pick up. Whether it is flat calm or 3-4 footers, you can run the same speed and not notice much of a difference. Our cabin has many of the amenities that our other boats were lacking. We have enough seating for 10 people without feeling like your in each others way. The head (bathroom) is spacious and comfortable (unlike most of the boats I have owned). We have a propane stove where we have cooked fresh fish on several occasions and a fridge to keep the drinks and food cold. One of the highlights for many people this summer was going up on the fly-bridge where you can watch friends and family catching fish and also look around at the amazing scenery. 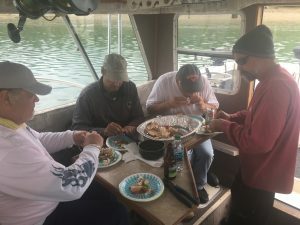 Halibut fishing as seen from above while rafted to another boat.